I'm in with an M3A2 halftrack. 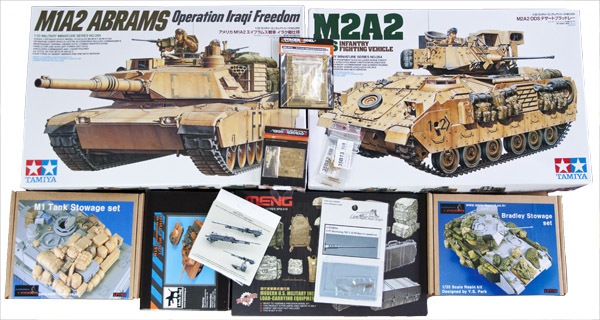 the campaign is open to any scale and subject, kit must be new and unstarted. I thought I'd ask this here. When did Tamiya get their reputation for Shake'n'Bake kits? I;m not talking accuracy but for very good fit and finish of parts. Was it around the T72M1? Before or later? Good question, Gary. 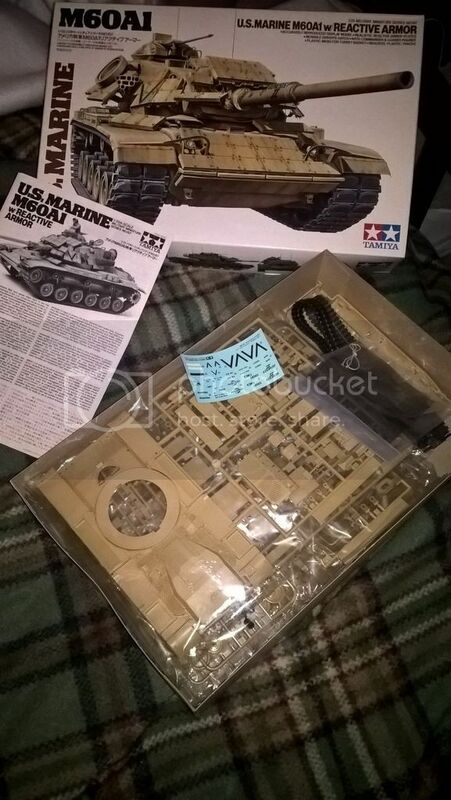 Tamiya was always my favorite as a youngster when I didn't know squat about accuracy because the molding was consistenly crisp and sharp and the fit flawless. Working on the on their original SdKfz 232 right now and although the fit is there the molding and crispness of detail is pretty bad. I still like Tamiya because I can make the build as quick and easy as I want, and still have plenty of opportunities to challenge myself with scratch-built upgrades. Always my go-to manufacturer for any newcomers asking where they should start. I started my build of Tamiya's 1/32 A6M2b Zero today. I am building it to replicate an aircraft that flew during the Battle of Guadalcanal, sometime between Aug - Dec 42. I should make some very rapid progress over the next several weeks as I am on vacation. That zero is an impressive size in 1/32 scale should look great! following with the walker bulldog. This build is off to a flying start, as I got to spend several hours at the bench yesterday. In a departure from my normal routine, I am building the engine first. Most of the little scratch building I plan to do will be on the engine, with the rest being in the cockpit. Anyway, here is the engine parts primed and ready for painting. Due to the complex nature of painting several different colors I have opted to paint individual parts/sub-assemblies prior to general construction, another departure from the norm for me. Jason, it is large, about the size on Accurate Miniature's old 1/48 TBF/TBM; which shows how small the actual plane was. Is that Tiger 131 you are standing next to? Is that Tiger 131 you are standing next to? Yes I live about half an hour from the tank museum so I'm down there a few times a year, it really is a beast! That is really very neat! Living in Germany, I only get to Great Britain once every 5 or so years, but I always make it a point to visit the Royal Tank Museum. I'm in with their Type 10 that I missed the Japanese military campaign with. Will be posting pictures in a couple of days. Day 2 of my vacation has seen some rapid progress on the engine due to spending several quality hours at the bench. I also snipped out the cockpit parts and spent some time working through how I plan to construct it. I did a very small amount of scratch building on the engine making some handle shaped items from copper wire and adding it to the cylinders; I also made some braces out of plastic strip and added them to certain sections of both cylinder banks. Finally I made some ignition wires out of copper wire and added some Tamiya tape strips. All items are painted and will be assembled tomorrow. I love this tank!!! looking forward to see it completed! cheers! It looks like there are going to be some very neat builds in this campaign. I was again able to spend several hours working on the Zero, completing the engine. I am pretty satisfied how the wiring harness turned out, though installing and painting it was a bit of a tense chore. I also made some decent progress on the cockpit, but nothing worth taking pictures of yet. Will have to wait for the weekend to get started. This will be my first time with photoetch and a metal barrel. One question about photoetch. I have to make several 90 degree bends with one piece. do i need a bending block or can i do it without? Hi Steve, very nice kit to build with a lot of sweet AM stuff. You can make 90 degree bends to very short pieces of PE, but you will get much better results using a purpose made tool such as a Hold and Fold or Etchmate. Hi Stephen, that is the correct type of tool. It is the smallest of several different versions. For what it is worth I would get either "The Bug" or the "Mark IV", as they give you more flexibility to the types and amount of different jobs you can do. Both those tools are made by The Small Shop. There are other manufactures of PE bending tools and it pays to look at reviews and to shop around to find the best one for your modelling needs at the best price. Here’s my line up. A bit of hubris for sure. 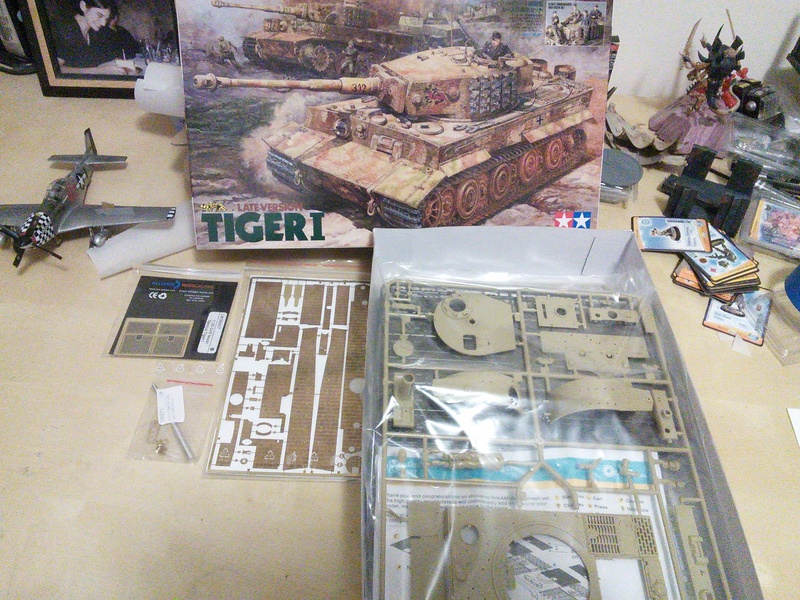 But on the other hand, it is Tamiya so I expect a nice easy build. I am planning to do some kind of “thunderously running in Baghdad” diorama. Many nice build here already from other participants. There are perhaps no days of our childhood we lived so fully as those we spent building a favorite scale model. Coming in with one of my favorite Tamiya Kits, the T-55A (built 3 variants already). Already took care of the idler and sprockets. Assembled and painted the wheels. The suspension. Having built 3 already, I'm moving quickly through the build. But I am building other stuff, so I'll see how fast I get through this one. One and a half run of track ready, second time working with the trumpeter indy links. Moved quicker through it this time around, but still feels like an eternity. This isn't going to be your standard T-55A, so look forward to the finish. The modern armor builds look like they will be pretty cool! I have made a fair amount of progress on the Zero. The cockpit is complete and I have gotten the first steps of the fuselage finished also. I did a small amount of scratch building on the cockpit, adding some cables and hydraulic lines. I opted to only lightly weather the cockpit with some scuffs and dings after a brown wash. Overall, I am fairly pleased with the results.